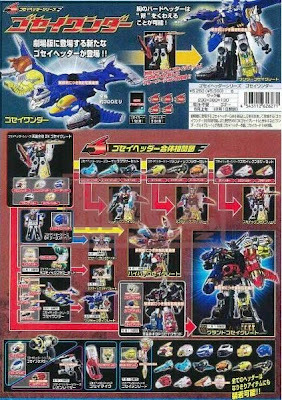 Toku Insider: New Goseiger Catalogue Pics! DX GoseiGrand. 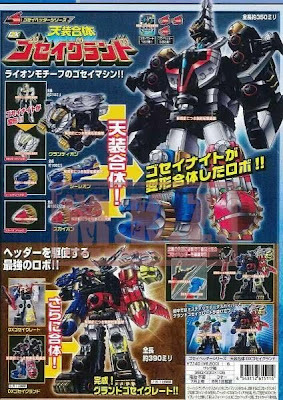 Knight's gattai robo of the Grandeon, Sealion, and Skylion (with him forming the head of Grandeon, and GoseiGrand.) 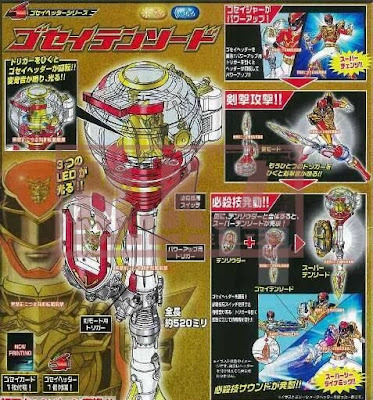 Grand and Great can gattai into Grand GoseiGreat, complete with a new staff-weapon that utilizes the other Headders. Grand GoseiGreat is pictured with Mystic DatasHyper at the bottom, meaning that the Mystic Brothers are a power up probably designed for Datas Hyper, so he can stand on even footing with this new comnbo. A mecha chart, showcasing all the formations. At the top is GoseiWonder, the bird-recolor of GoseiDragon, holding 5 new headders, including its own Bird Headder. When it combines with GoseiGreat, it swaps out with the Dragon to form "Wonder GoseiGreat."